Smith sounds like someone who probably bought Bitcoin during the December 2017 high. There are many investors (hodlers) who have realized the long-term investment potential of the top-ranked cryptocurrency and have held on to their BTC for long. Permabulls like the Winklevoss twins and Tim Draper come to mind. 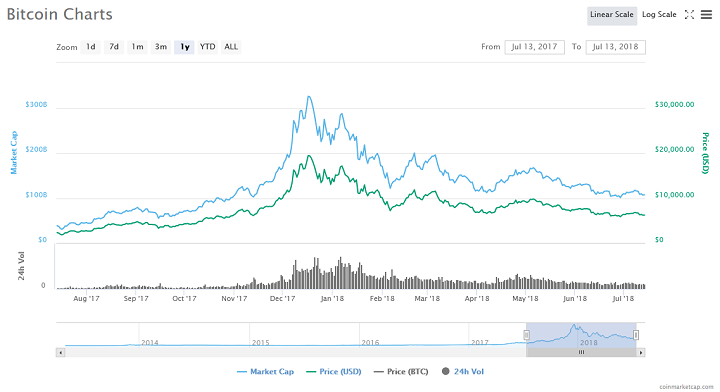 Smith makes another inaccurate assessment in his analysis when he says that BTC is not attractive when the price is in decline, unlike “real investments.” The reverse is the case. BTC is most attractive when prices find a new floor, it is called “buying the dip.” Bitcoin goes through repeated cycles on boom and bust. Anyone familiar with its history knows that 70 percent peak to trough dips aren’t new in the BTC market. What makes the South Sea Bubble particularly interesting is that it encompasses multiple waves of scam offerings that were popular in 16th-century Britain. Sir Isaac Newton famously fell victim for one of the scams, losing £20,000 in the process. Smith argues that the price of Bitcoin has no basis in any economic fundamentals just like the South sea nitvender. Smith ignores the finite amount of the total Bitcoin supply in his zero-sum crypto Armageddon. BTC is also divisible up to eight decimal points meaning there are ten million place values to which economic value can be assigned depending on the total market cap when all 21 million BTC have been mined. The truth is that folks like Smith fail to understand that tokenomics don’t bend to the crooked scales of mainstream economics. Mathematically speaking, BTC isn’t a zero-sum game; thus, it isn’t a Ponzi scheme. Do you agree with Gary Smith’s analysis or is he another ‘nocoiner’ who is ignorant of how Bitcoin works? Keep the conversation going in the comment section below. First off, it is stupid to put broad labels like “nocoiner” on people. Please stop. Let people have their say without trying to label them. Second, it’s only natural for everyone in the herd who does not know how asset values are set (by the emotional herd) to dis an asset which has collapsed like bitcoin has collapsed. IF you want to see nocoiners, go find the people who bought the december 2017 bubble. They have gotten screwed. Third, the Elliott wave model predicts a likely bottom for this within about a week. GBTC=high 3s to $4. But then its a buy again for another big run. Interesting that this site will not let you post a negative picture of bitcoin!